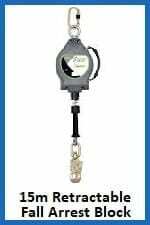 So what is the difference between a fall restraint system and a fall arrest system? The restraint version “restrains” the wearer and so helps to prevent a fall in the first place. The arrest system “arrests” the fall, meaning that it will catch the wearer at a certain distance should they really fall. 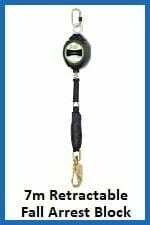 Retractable fall arresters are available, these are great as they automatically adjust to keep the safety line under constant tension. The rescue block is a similar piece of kit, however it enables a second person to reach and rescue the fallen worker quickly. The fall arrest system enables much more freedom of movement with fewer restrictions than the fall restraint system. They are ideal where the wearer needs to move around more freely to get the job done. They are usually attached to one of the ‘D’ ring anchor points on the users safety harness, some of which will have only one anchor point some will have multiple, these are better for work positioning as the arrest block can be changed between points to aid movement. A fall arrester system which retracts, will automatically self-adjust the safety. Continuous tension is applied so the wearer can operate at different distances away from the point at which he is secured. Rescue blocks are a similar piece of equipment, but they are intended to allow someone else to rescue the wearer in grave situations. When using a fall arrester the safety lanyard must be of the correct length so as to catch the wearer in mid air in the event of a fall, not allowing them to hit the ground. These systems can also be used to suspend the wearer in mid-air to work on awkward jobs. Force factors and deceleration rates also play an important role in the safety of the wearer. 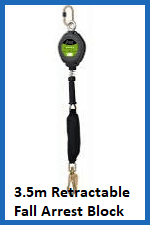 Force factors; meaning the force applied to the user and the structure, transmitted through the deceleration rate when a fall occurs, these forces are calculated in kilo Newton’s, ( kN); and so the system needs a certain amount of deceleration distance built in, this can be done by including a shock absorber lanyard. 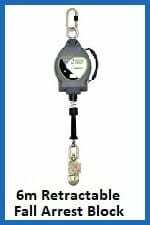 Do you need more information on fall arresters or our safety harness kits which work well with these fall arresters? Call 01384 78004 or drop us an email through the contact us page or rapid enquiry form. Fall Arresters Overall rating: 5 out of 5 based on 6 reviews.